In this guide we are going to explain what sort of coins you may come across here at Pledge. We will explain a bit of history and other important information that may help out with your enquiry. If there is anything else you would like to know we will try and help you out as best as possible. The half sovereign was first introduced in 1544 under Henry VIII. After 1604, the issue of half sovereigns, along with gold sovereigns, was discontinued until 1817, following a major revision of British coinage. Production continued until 1926 and, apart from special issues for coronation years, was not restarted until 1980. It was also used extensively in Australia, until 1933. Modern half sovereigns, from 1817 onwards, have a diameter of approx 19mm, a weight of approx 4g, and are made of 22 carat yellow gold. The reverse side, features St. George slaying a dragon and was designed by Benedetto Pistrucci, whose initials appear to the right hand side of the date. The Full sovereign coin was first issued in 1489 for Henry VII of England. The earliest portraiture of the gold sovereign shows the king seated on a throne facing whilst on the reverse is a shield with the Royal coat of arms which is surrounded by the Tudor Double Rose. The gold sovereign is still in production today and although the coin itself has a nominal face value of around £1 sterling, it is primarily classed as bullion and therefore you will not find any valuation mark on the coin. 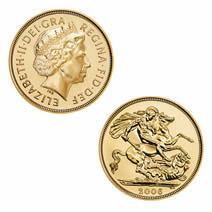 A full sovereign coin is approximately 8g of 22ct yellow gold and measures approx 22mm. The reverse sides of the full sovereign coins again have the image of St George slaying the dragon or can even feature a shield on the earlier more rare coins. Queen Victoria 1837 – 1901 Since 1871, British sovereigns were struck at branch mints, in addition to the Royal Mint in London. The first branch mint to strike sovereigns was Sydney in Australia. It made good sense to produce British sovereigns close to the gold mining source areas, rather than ship the gold to London to be made into coin, then possibly ship it back again. In 1872, the Melbourne mint followed. 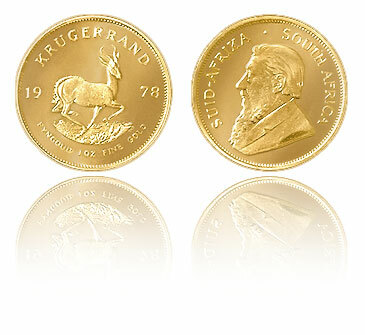 Krugerrands were first minted and issued in 1967, and have been produced every year since. They have legal tender status in South Africa, which allowed them to be imported into many, but not all, countries without import taxes, duty or VAT. Originally only one size was issued, which contained one full troy ounce (31.1035 grams) of fine gold. This was originally known as a Krugerrand, or Kruger, for short. From 1980, three other sizes were introduced, namely a half, quarter, and tenth ounce size. Because of these, the original Krugerrand is sometimes referred to as a "full" or "one ounce" Kruger or Krugerrand, although within the trade, the word Kruger or Krugerrand is understood to be the full sized original one ounce version.